Because there are some clogs that fight back, Conyers Plumbing specializes in hydro jetting or high-pressure water jetting. If you are experiencing sewer line blockages, water backing up through your drains, or reduced water flow, you may have grease, sludge, sand and debris clogging up your sewer lines. Our high-pressure hydro jetting service can help you clear your sewer system by flushing out grease, sludge, and scale. 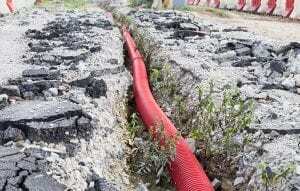 Cable drain cleaning machines are used to break through solid obstructions like roots. However, they are less effective in removing softer blockages such as grease, scale and other buildup. Cable machines will bore holes through sludge and grease but won’t clean and push the debris from your pipes as effectively as hydro jetting, because hydro jetting is a unique process designed for just such a situation. High-pressure water jetting is a sewer repair technique that uses water pressure to scour the insides of a sewer pipe. A special head is fitted to a water hose, and after that, we introduce into it a sewer line via a small access point or drain on your property. The head sprays water at a very high pressure while being led through the sewer line. There are many different hose heads for different jobs, therefore your plumbing technician will know exactly which to choose to clean the problem affecting your line. Hydro Jetting is often required before or after a camera inspection, because sometimes the initial camera inspection will reveal blockages that need to be cleared out. At other times, Conyers Plumbing might need to hydro jet the lines first just to get a good look with the camera. Every situation is unique, and because we focus on your satisfaction, we have many options available.